My work has always involved a fair amount of travel. And so early on, I discovered the value of joining various reward programs, where the airline or hotel chain or rental car company gives you a certain number of reward points each time you use their services. Those reward points can then be redeemed for free flights or stays or rentals. I know many travelers actually choose the company with which they travel based on the reward points they are seeking to accumulate. That’s exactly the kind of loyalty the company is seeking to achieve with its program. However, I’ve always felt that I should try to choose the least expensive option, whether using my employer’s travel funds or my own. So over the years, I’ve ended up joining multiple rewards programs, hoping to earn at least a few points, no matter what hotel or airline happens to be least expensive. I think that’s why a certain television commercial caught my attention a few days ago. It was advertising a new rewards program, one that multiple companies of all different types were cooperating to sponsor. There were nationwide chains of supermarkets, gas stations, retailers, and insurance companies, as well as the option of earning points through online ordering. And not only could you earn points in these multiple ways, you could spend them in multiple places! Now I’m not mentioning this program to endorse it or encourage anyone to try it. But I have to admit it was very attractive to someone like me, who wants to choose the best option for my employer or me, regardless of which company is providing the service. These individual companies had chosen to work together to provide rewards in ways that were more beneficial to me, their shared customer. It then occurred to me that this is actually one of the reasons that I find our Southern Baptist Cooperative Program so attractive and compelling. What if individual SBC mission boards or ministries chose to compete with one another for my loyalty and support? What if I had to choose between state missions, North American missions, and international missions? What if my missions dollar only “earned points” with one “service provider,” to the exclusion of the others? churches, they grow and can be “redeemed” through multiple service providers, not just one. How many “points” for missions does your weekly giving through your church earn? If you don’t know, that’s a good question to ask your missions or finance committee, or your pastor. 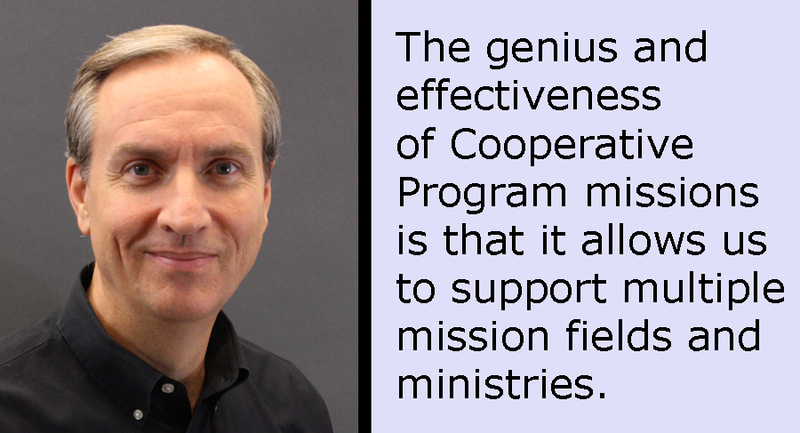 My home church designates 10% of its undesignated offerings for Cooperative Program missions. That means a dime out of every dollar I give each week earns multiple “rewards,” through the International Mission Board, the North American Mission Board, the Ethics and Religious Liberty Commission, our six world-class seminaries, and, of course, right here in Illinois through IBSA. I really like the title of that rewards program I saw on that TV commercial. They simply call it “Plenti.” The idea, I think, is that there are plenty of points to be earned, and plenty of service providers to provide plenty of benefits to plenty of customers. It’s not competition and scarcity, but rather cooperation and generosity that lead to plenty. It’s a truth that we as God’s people should model, especially through our missions giving. Cooperation is the pathway to plenty.